Well, this is just brilliant. 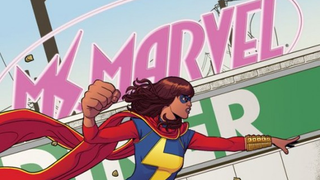 Racist adverts promoting hatred against Muslims are currently being run on buses in San Francisco - but someone has started covering them up with anti-hatred messages from Marvel's première Muslim superhero, Ms. Marvel. The adverts were purchased by the American branch of the Freedom Defence Initiative - who, here in the UK, are actually classified as a known Hate Group - and equate Muslims with Nazis. Because, ya know, playing the Nazi card straight away is the perfect method of displaying your point of view as something reasonable. Well done guys. Well done on point two, too - running Islamophobic adverts on buses in San Francisco, an exceedingly liberal city. That's bound to go well! Sometimes, instead of bickering among ourselves about them, it's nice to see Comic Books being used to promote the ideals their heroes stand for.